2,890 pages of CIA files, 3 hours and 30 minutes of CIA and Reagan Library videos covering CIA information provided to Ronald Reagan between 1980 and 1989, related to the Soviet Union and the Cold War. A multimedia presentation prepared by the Central Intelligence Agency's Information Management Services Historical Division for its symposium held on Ronald Reagan and CIA products presented to the Reagan Administration. This title requires the use of Windows for the multimedia presentation. MAC users can access a search PDF file of the 2,890 documents. The document collection featured in the presentation includes intelligence assessments, National Intelligence Estimates, high-level memos, DCI talking points, CIA finished intelligence reports and other reporting. Also included are non-CIA documents from the archives of the Reagan Library, including minutes from relevant National Security Council and National Security Planning Group meetings on key US-Soviet issues, as well as copies of key National Security Decision Directives (NSDDs). 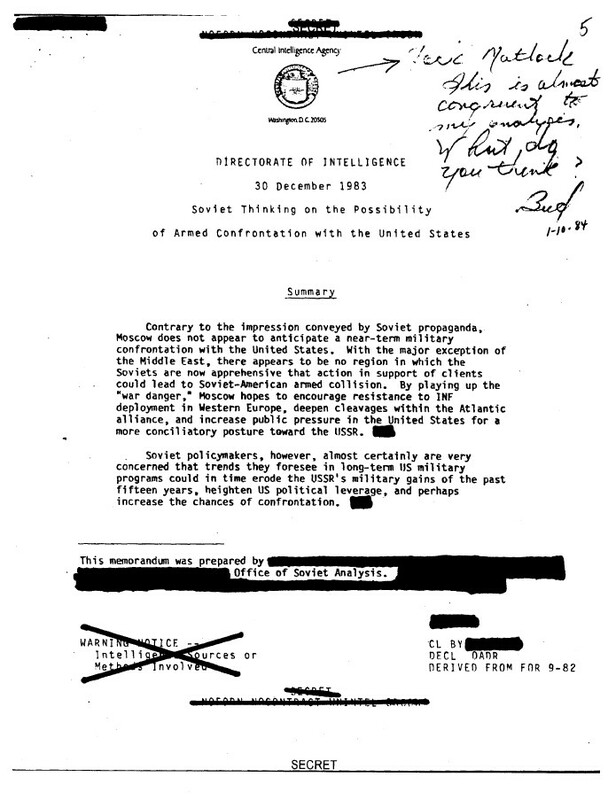 In early November 2011, the Central Intelligence Agency's Information Management Services (IMS) published a collection of more than 200 documents, including approximately 50 newly declassified and released documents, highlighting intelligence the CIA provided to the Reagan Administration on key Soviet issues. The document coverage includes: high-level arms control summits between former US President Reagan and former Soviet leader Mikhail Gorbachev, Soviet attempts to revamp an increasingly inefficient and failing economic system, and evidence of widening fissures in a Soviet society which was becoming increasingly difficult for Communist Party leaders to control. To highlight the release of the documents and their publication, IMS, in partnership with the Reagan Library and the Center for the Study of Intelligence, hosted a symposium on Ronald Reagan, Intelligence, and the End of the Cold War. The event was held at the Ronald Reagan Presidential Library in Simi Valley, California, on November 2, 2011. The program included presentations by a number of distinguished speakers and panelists, including CIA historian Nicholas Dujmovic, author and former CIA employee Bruce Berkowitz, senior policy analyst at the RAND Corporation and director of the RAND Center for Global Risk and Security Greg Treverton, Reagan adviser Ken Adelman, former KGB Major General Oleg Kalugin, and CIA Deputy Director for Intelligence for Analytic Programs Peter Clement. 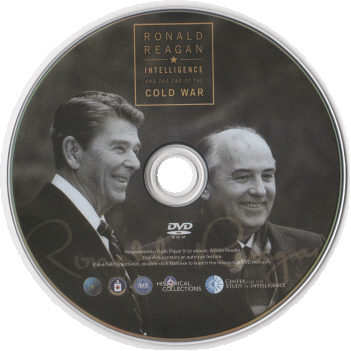 In their presentations they made the following judgments: President Reagan, contrary to popular belief, was an avid reader of intelligence products; The documentary record indicates the CIA and the Intelligence Community did not "miss" the collapse of the Soviet Union, but that belief persists because of the writings of a few individuals who are often cited by pundits; Intelligence is about creating and adjusting stories; questions not asked or stories not imagined by policy are not likely to be developed by intelligence. Perfect accuracy should not be expected from intelligence when oftentimes policymaker focus is not in the right place and the right questions are not asked. Also included on the disc is a scanned copy of the program given to attendees at the November 2011 conference. The program includes papers presented by speakers and panelists at the Symposium. 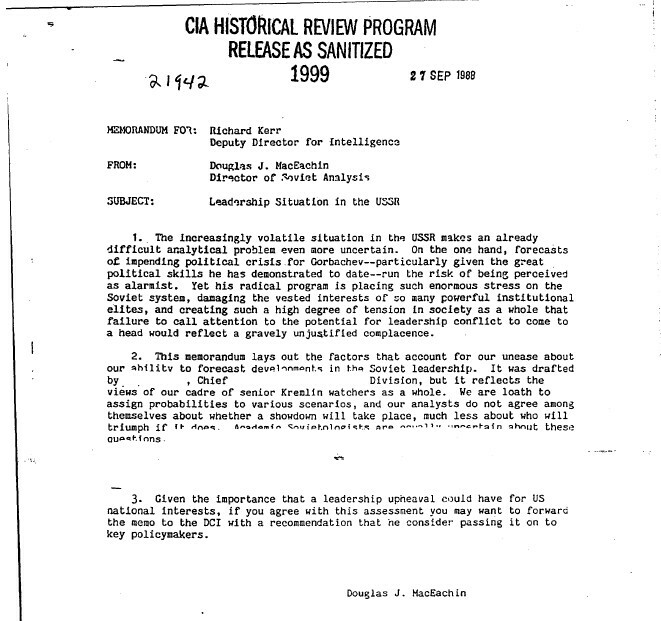 In addition to the documents, the presentation includes video briefings created by the CIA. Produced by the CIA's Directorate of Intelligence on such topics as the Soviet space program, the Andropov succession, the Chernobyl disaster, the Moscow summit, and the Soviet media portrait of America. These briefings represent the first time the Agency used videos on a regular basis to deliver intelligence to policymakers. The entire collection marks the first substantial release of such historical material by the CIA. 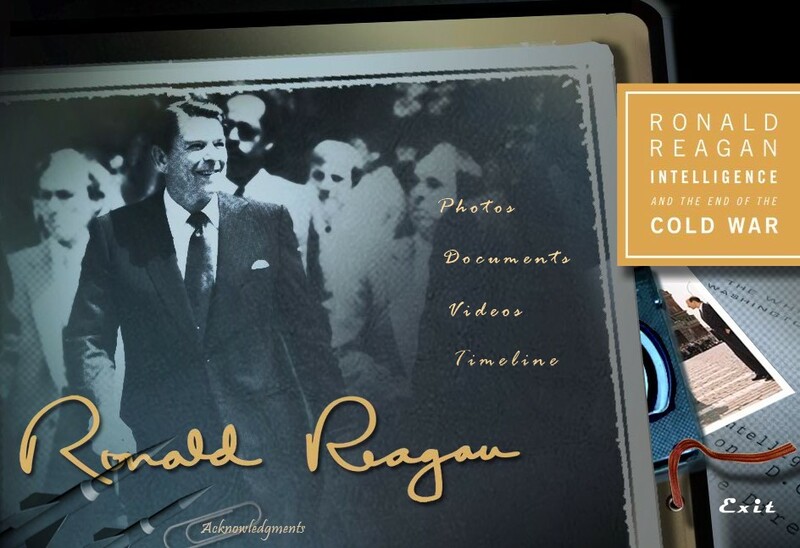 Other multimedia material includes photos, videos, and an interactive timeline featuring material from the Reagan Library's audio-video archives and other sources. Documents on CIA briefings of President-elect Reagan and his staff in the months before Reagan took office. 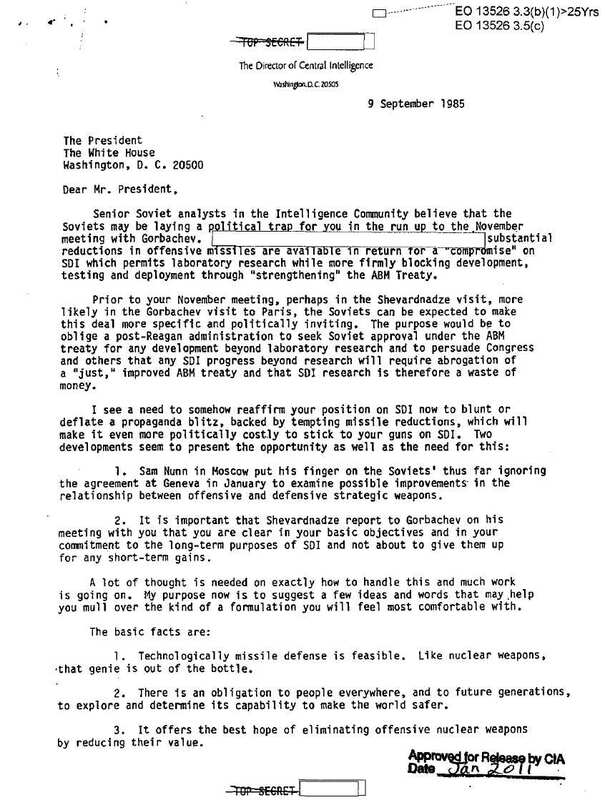 A July 17, 1981 Interagency Memo on Discussion of U.S. Intelligence Needs on Soviet Ballistic Missile Defense, with tasking memo from Richard Allen. A November 16, 1981 National Security Decision Directive Number 15 titled, Theater Nuclear Forces. An April 1, 1982 NIC Memo titled. "The Soviet Bloc Financial Problem as a Source of Western Influence," with cover memo to the Director of Center Intelligence from NIC Chairman. An April 1, 1982 DI Intelligence Assessment, the Soviet Political Succession: Institutions, People, and Policies. An April 21, 1982 meeting minutes of a National Security Council Meeting on Strategic Arms Reductions Talks. An April 3, 1982 Letter to the President from William J. Casey regarding Soviet Political Succession. A May 1, 1982 DI Research Paper, Soviet Economic "Reform" Decrees: More Steps on the Treadmill. 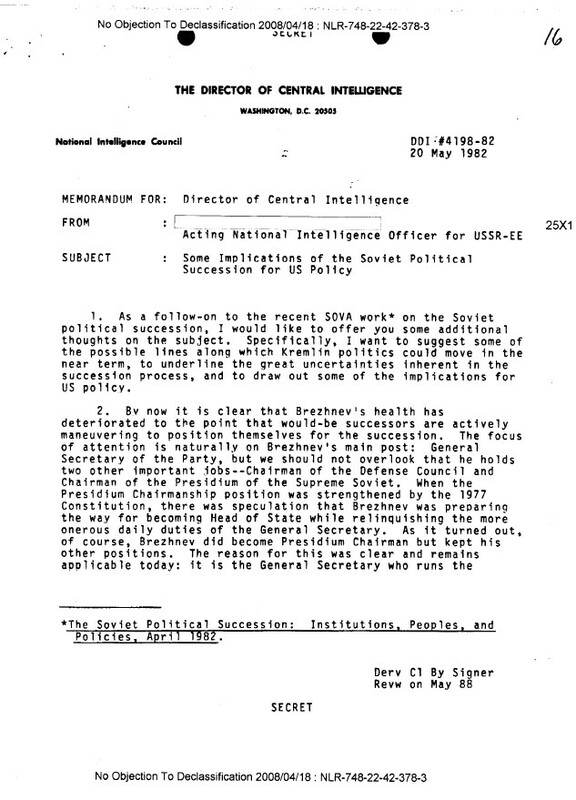 A May 5, 1982 Tasking memo from DCI Casey to Deputy Director for Intelligence on Policy Implications of Soviet Succession. A June 25, 1982 Special National Intelligence Estimate, Soviet Policies and Activities in Latin America and the Caribbean. 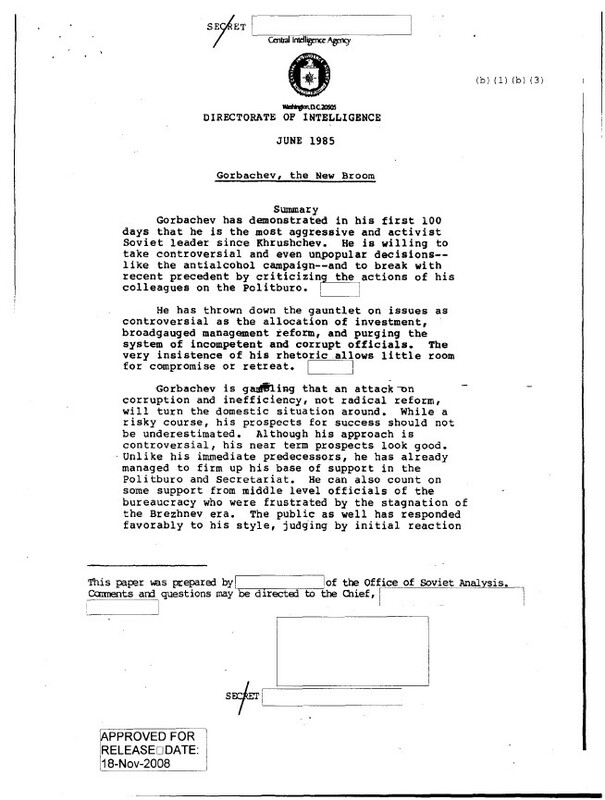 An Internal NIC Memo dated July 26, 1982, The Soviet Challenge to US Security Interests. A DI Intelligence Assessment dated August 1, 1982, Depressed Trajectories: Unlikely Role for Soviet SLBMs. A National Intelligence Estimate dated October 13, 1982, Soviet Ballistic Missile Defense, Key Judgments and Summary. A May 27, 1983 DI Memo, with two cover notes, titled Soviet Use of Economic Relations for Political Purposes. A September 12, 1983 NIC Interagency Intelligence Assessment, Possible Soviet Responses to the US Strategic Defense Initiative. 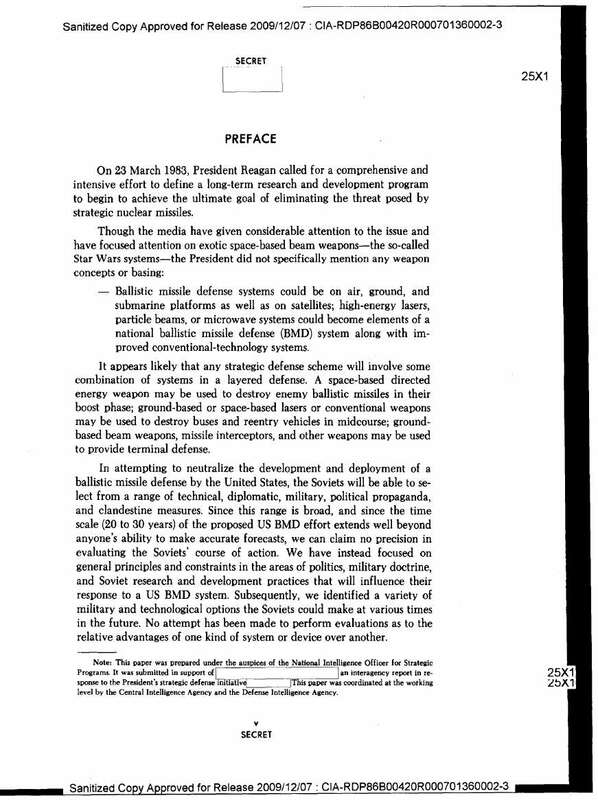 A November 24, 1987 Memo by DDCI Gates, Gorbachev's Gameplan: The Long View. DI Research Paper, December 1, 1987, The Chernobyl Accident: Social and Political Implications. 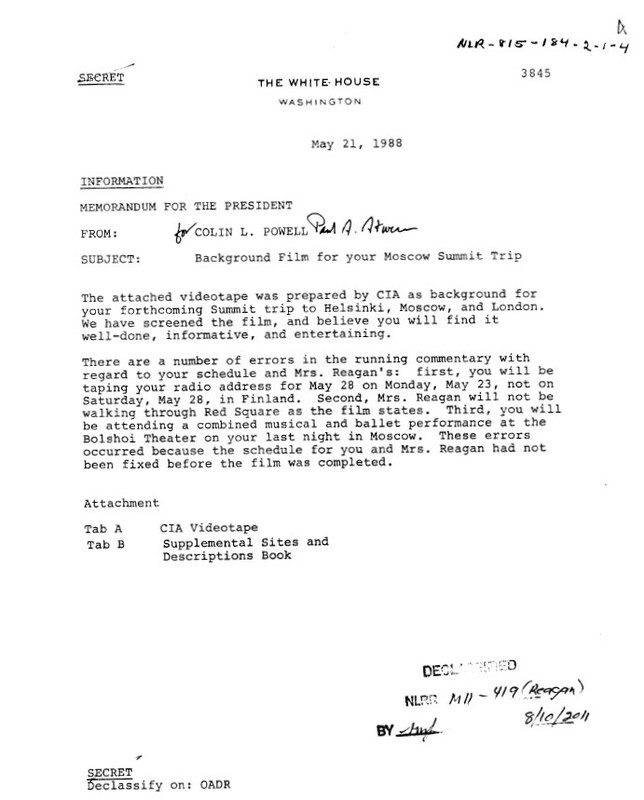 NSC Memo to President Reagan from Colin Powell, dated May 21, 1988, regarding Background Film for your Moscow Summit Trip.